Predicting which women will successfully deliver with induction can be difficult. The Bishop score is a standardized system used to evaluate the probability of successful vaginal delivery. Scores were obtained at the time of 500 vaginal examinations performed on patients who fulfilled all the basic criteria for induction but, instead, were allowed to progress to the spontaneous onset of labor. 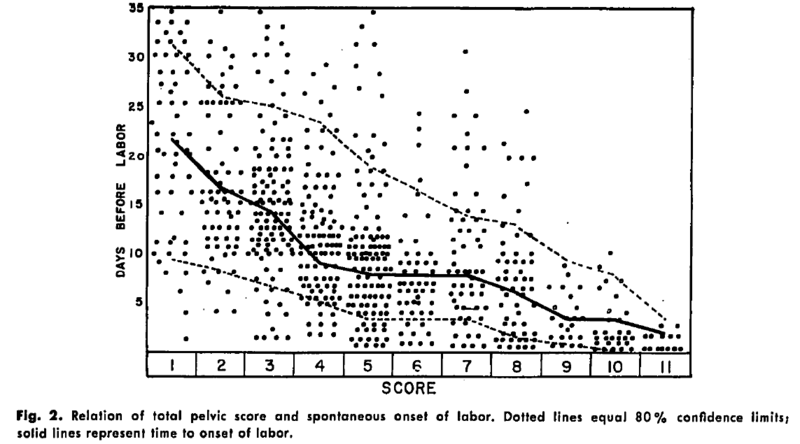 Utilization of such a score permits the obstetrician to perform elective induction of labor in close proximity to the time when spontaneous onset of labor would naturally occur. The Bishop score for vaginal delivery and induction of pregnancy was originally developed to predict failure of elective induction in multiparous women. It is commonly considered for predicting the need for caesarean section after induction and preterm labor. The scoring system was developed prior to cervical ripening agents. External validation in cohort of 2,916 women undergoing digital cervical examination at 22–24 weeks. Validation study authors: Newman RB, Goldenberg RL, Lams JD, Meis PJ, Mercer BM, Moawad AH, Thom E, Miodovnik E, Caritis SN, Dombrowski M, and Thurnau GR.